Welcome to Episode #18 of the Living Homegrown Podcast! 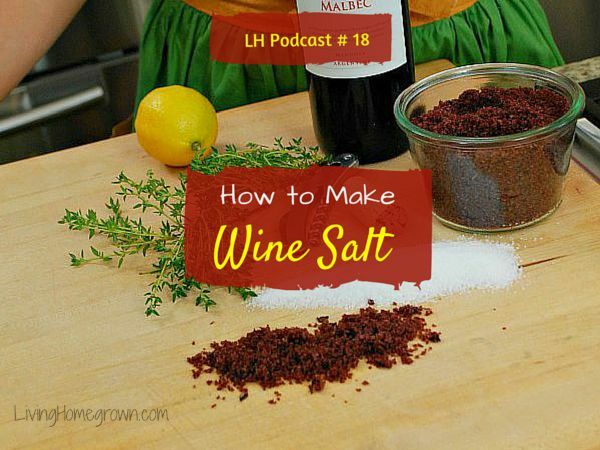 This episode is all about how to make wine salt. The key starting ingredient – mess this up and you won’t like how your salt tastes! Excalibur Dehydrator* – In the podcast I mention that I use my Excalibur. This is a high end dehydrator – but you DO NOT need one this fancy! Any dehydrator will do. And if you don’t have your dehydrator, use your oven or your counter top for drying out the wine salt. Have you ever made wine salt? I am LOVING your podcast!!!! My sister and I canned a few jars of marinara a few weeks ago. We did not add vinegar (because my mother-in-law never added to her tomatoes) and we left the rings on. Now I understand and will do as recommended. I made wine salt last night and it doesn’t seem to be drying. It seems to be sticky. I used a sweet white wine. Left in 150 oven for 2 hours and then turned off heat and went to bed. This morning it was hard and stuck to pan? After church I put back in oven; it softened and I stirred occasionally for 2 more hours. It softened again but doesn’t seem to be drying. Help please! I really want to use it n my chicken tomorrow. It sounds like there may have been a bit more liquid than I usually have. That is an easy fix. Just add more salt! Add about 1/4 cup more salt to your mixture and stir well. Spread it on a cookie sheet lined with parchment paper (if you can) and that will prevent it sticking to the sheet. Then set it out on the counter for a few hours and see if it feels dry to the touch. If not, you can go ahead and do 2 more hours in the oven. I have never used a sweet wine, so perhaps the sugar content is just making it feel sticky and wet when it is indeed fairly dry. Even if it is still wet, you can use some on your chicken. It will taste great! The video link doesn’t seem to be working; it says that the video is unavailable. I’d love to try this recipe! Thanks for letting us know that the video isn’t working. It used to be up on our PBS TV show website, and it’s no longer available there. So sorry about that. But you don’t need the video in order to make the recipe. All the instructions are in the printable recipe. It’s super easy! I promise!